If you're in search of ballet schools for children in Arizona, then look no further. Below you'll find some great recommendations, as well as what to look for if you decide to strike out on your own search. Many young children, especially little girls, express at least a fleeting interest in the creative arts during their youth. Some parents decide to cultivate this through professional children's studio lessons that can easily develop their son or daughter's cognitive movement skills while fostering their imaginations at the same time. Although it's fairly simple to purchase a pair of dance shoes and tights, it is much more challenging to find the perfect learning environment for your special dancer. Especially in a fairly large state, where the population is dense enough to warrant countless ballet schools for children in Arizona, the selection process can be tricky even if you're being quite choosy. Everyone wants what's best for their little dreamer, as we all desire to give our children the best start at any of their endeavors. Check out the following list of qualities and characteristics important to keep in mind during your search. 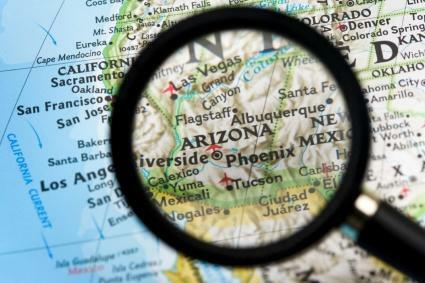 When visiting various ballet schools for children in Arizona, be on the lookout for a few things. First, check for cleanliness and safety. Are the ballet barres fastened securely into the studio wall, or are the portable barres sturdy enough to not be tipped over by a child? Is the floor clean and even, and is it sprung properly to absorb shock to the body when the dancers leap and jump? Is the teacher mandating the dress code requirements, which prevents tripping, falling or getting caught on objects during class? Safety is the most important aspect of any studio, as you'll obviously have a difficult time leaving your child in a facility where you do not feel he/she is safe and sound. Feel free to ask the teacher or studio owner any questions you may have in regard to safety regulations. Next, observe the teacher-student ratio. If a teacher has too many children, she will not be able to provide enough individual attention to each participant. This can lead to a waste of time and money, as your child will be attending to learn a much disciplined craft. Poor training can hinder advancement and outright destroy professional opportunities if your child decides to pursue a dance career someday. Finally, what is the cost of the courses? Some ballet schools gouge their prices, especially in financial times where things are very difficult and they're trying to keep their business open. Seek out quality for your money, and don't be afraid to compare price tags. Many ballet schools have websites with their costs per class listed, so you oftentimes can narrow down your options with a simple click of the mouse. Here are a few dance school options to get your started. Classy and concise in its training, the Arizona School of Classical Ballet is a great choice due to the fact they focus on only one style of dance. Ballet reigns supreme in this facility located in one of Arizona's most famous cities. Starting at age three and going on up through adulthood, there are classes for every age and dance skill level, including advanced pre-professional classes for teens and performance opportunities for accomplished students. Teaching ballet as well as many other forms of dance, Jeanne's School of Dance is a great place for your child to not only try ballet, but other forms of movement on for size. Around since the 1950s, Jeanne's has expanded into four distinct studio locations - Chandler, East Mesa, Queen Creek and Mesa. No matter which you choose to attend, you're sure to get a quality teaching experience with a personable staff eager to help your children succeed every step of the way. One of the largest ballet companies in Arizona is Ballet Arizona, which includes a school to teach those who are hoping to one day move on to either their company or other professional dance troupes in the nation.